Our nurseries are ideal for infant care. In our infant program, we focus on providing comfort for our infants, and help them develop and grow in these crucial early years. 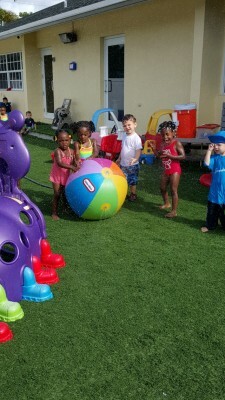 In our toddler programs, we focus on fun! Kiddoes learn through fun activities, and we work on essential skills including potty-training. Children begin to learn basic skills like writing, reading, music, art, and even cooking in our preschool program. We strive to keep kiddos occupied with fun-filled learning activities. As our kids approach four- and five-years-of-age, they begin to master motor skills. This time is crucial for fitness and development, and we continue mental development with further writing, reading, music, and art lessons. Aftercare is ideal for kids of various ages, and an excellent option for busy parents. In our aftercare program, we’ll have fun age-specific activities, and we can tackle homework projects for kids who have school work to which they should attend. Summer’s a great season here at Home Away From Home! We keep kids happy, occupied, and growing with field trips and fun throughout the summer.